When a witness is inexplicably murdered in a locked room at a federal courthouse, Dr. Lee Rosen is put on the case. 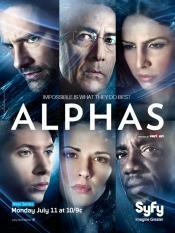 He leads a team of "Alphas", human beings with enhanced abilities due to differences in their brain structure: Gary Bell, a highly functioning autistic with an ability to process information that rivals most computers; Bill Harken, a former FBI agent who can amp up his "fight or flight" reflex, giving him extraordinary strength for a brief period of time; Nina Theroux, a beautiful woman who can reprogram other people's minds to do as she bids; and Rachel Pirzad, a sheltered Persian girl who can intensify one sense at the expense of the others. However, with said powers comes a price - for Gary, autism which makes him a child for all intents and purposes; for Harken, severe anger issues that cost him his job and family; for Rachel, struggling to overcome her parents shame at her "illness"; and Nina, never really knowing how those close to her actually feel. In any case, they've all come together for the common good with Rosen as their mentor, teaching them to further control their abilities with each passing day. As for the courthouse murder, it's not long before the team uncovers that one of their own kind was responsible - Cameron Hicks, a former Marine sharpshooter with supernatural balance and aim (he guided the bullet through a ventilation duct). After bringing him in, however, they realize someone even more powerful was pulling the strings... someone with a new technology that can be used to mimic one of the team's gifts. This page has been seen 3055 times.